Syrian refugees flooding over the border with Turkey now number over 3,000 persons as Turkish officials struggle to deal with the influx. Turkish sources are reporting that the government is prepared for 15,000 more to arrive from the town in the coming days. Some Syrians waiting at the border are also meeting up with their relatives from the other side who bring them provisions, which they then carry back into Syria. The town of Jisr al-Shughour was besieged from three directions, another Syrian refugee, Ahmet Arafat, 40, claimed. “There are wounded [people] in Jisr al-Shughour, and no one can help them,” he said. “We had restaurants and shops in Jisr al-Shughour. They razed them to the ground. They are shooting protesters too. They even poisoned the waters. We saw people as they drank from the water and died,” said another Syrian refugee, K.F., 24. Prime Minister Erdogan has said that today and Saturday will be very important in terms of determining Turkey's future relations with Assad. The National Security Council (MGK) is set to meet after Sunday's elections. UPDATE I (6/10) -- Hurriyet Daily News correspondent Ipek Yazdani reports that Syrian refugees coming from Jisr al-Shughour, a town of 50,000 people just 12 miles over the Turkish-Syrian border, are telling Turkish authorities that Syrian security officials attacked the town early this morning. The town has been surrounded from three sides since Wednesday. HDN had the exclusive footage of the Syrian refugees waiting at the Syria-Turkey border on Friday showing them protesting against the regime of Syrian President Bashar al-Assad. "Syrian soldiers killed all the young men in the village", an old woman amongst the Syrian refugees waiting at the border said in an excluseive footage obtained by the HDN. Syrians escaping from the Syrian security forces who allegedly made a military operation to Jisr al-Shughour, Ghani and other villages massed in Turkish border, chanting slogans like "We want freedom, we want liberty." 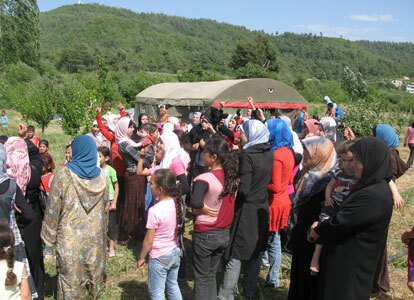 A woman from Sıleybi village said the Syrian soldiers killed her husband. "They (Syrian government forces) attacked us at 6:00 a.m., they have been trying to kill us all day long and they killed my husband. Now they pretend like nothing is happening, they are lying! They threw us out of our country, they threw us out from our land," she said. Another woman who showed her baby to the cameras said, "President Assad, you left this one without a father. Don't you have any fear of God?" A man who talked to the camera while walking said, "Assad, don't you have any conscience? Is this Bashar's justice? We were all kicked out of our homes, you see all of us, all the Syrians in this region are gathering here now. So all the world shall see what we are going through." "They attacked all of us and we had to run away. They killed my husband, he was murdered while he was trying to protect us" another woman said in a different footage shot in a tent by the Syrian side of the border. "Syrian soldiers killed all the young men in the village, they burned our houses, God punish them, God punish Assad", an old woman shouted to the camera. UPDATE II (6/10) -- In response to this morning's incursion into Jisr al-Shughour, Prime Minister Erdogan issued his strongest statement yet against Assad, acussing the Syrian government of committing mass atrocities and "behaving inhumanely." “In the face of violence, we cannot continue to support Syria. We do have relatives living in Syria,” said Erdogan. The prime minister indicated that he has not been in contract with Assad since the seige began. Turkey is refraining from calling those fleeing refugees, saying he hopes they will soon be able to return home. In the meantime, the UN High Commissioner for Refugees (UNHCR) is prepared to step in should the Turkish government need assistance. At the moment, Erdogan says neither UNHCR assistance nor a "safe haven" are needed. Though Turkey is keen to keep Syrian refugees safe and do the right thing here, it is also understandably concerned about its border and the potential for a repeat of Operation Provide Comfort, which played a major role in initiating the Kurdish conflict of the 1990s. UPDATE III (6/13) -- The number of Syrian refugees is now up to 5,000, with another 10,000 waiting just over the Syrian border, ready to leave if need be. Syrian security forces are in complete control of Jisr al-Shughour.